At the old trap shoot area in the dead tree area – 4 adult Red-headed Woodpeckers, immature Yellow-bellied Sapsucker and Wilson’s Snipe. One Yellow-crowned Night-Heron continues at Jefferson Road, Parsippany (Jim Mulvey). 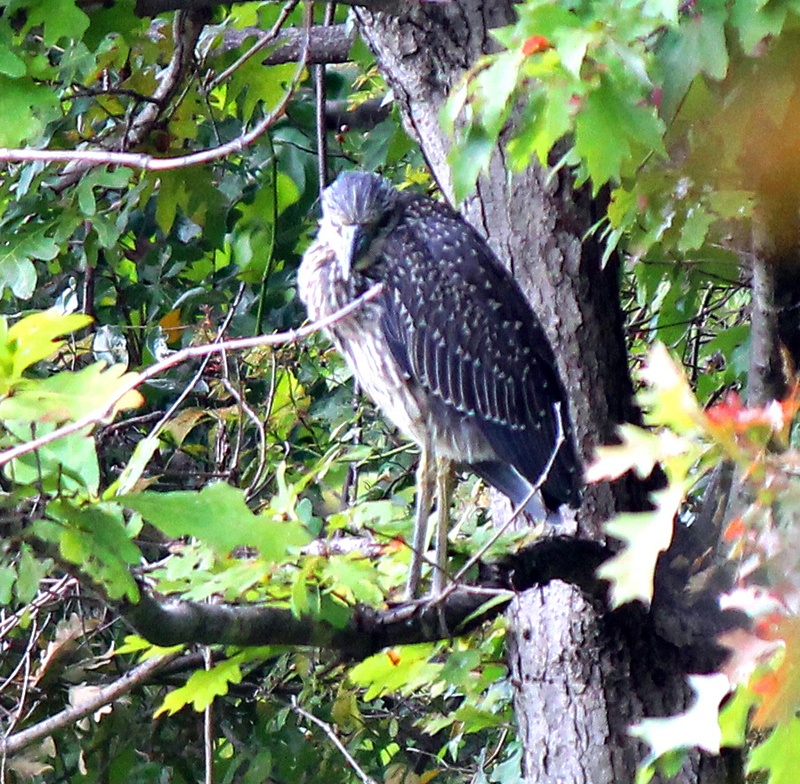 Yellow-crowned Night-Heron, Parsipany, NJ, Sep. 30, 2013 (photo by Jim Mulvey). I led an NJAS field trip to the West Morris Greenway on Saturday and found some fairly good birds. Perhaps most notable was the presence of no fewer than 4 Barred Owls, all calling in broad daylight (a new personal high for me in NJ). One bird even came in close to us for a good look (both by us and by the bird). Prior to the field trip, I again visited Roxbury (AKA Mudder’s) Pond, which continues to look very interesting to me. I’m not sure I’ve seen exactly the type of habitat that is there anywhere else in the area. The only notable find was a Sora – a challenging migrant to find in the county. West Morris Greenway is a new mile-long+ trail that runs through the Morris County Municipal Utilities Authority area just north of Black River WMA. Access is easiest from Roxbury Park along Righter Rd. Notable species there besides the owls included a Philadelphia Vireo, Wilson’s Warbler and 2 Lincoln’s Sparrow. The field trip ended up with 45 species and I had another 5 or so at the Pond beforehand. Best, David.